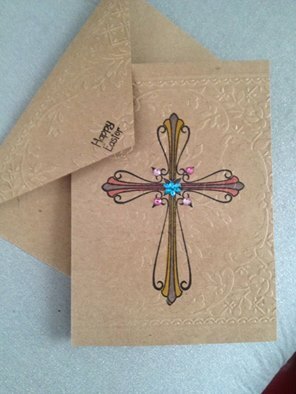 Greeting Cards and Notes are Hand Stamped, Hand Embossed and Hand Colored. Tags are Hand Tea Stained, Dried, Stamped , Embossed and Colored. Cards and Tags can be SPECIAL ORDERED, we have many Stamps and Embossing Folders. Our Handmade Cards and Tags can be customized to fit your event. We can make Cards and Tags for all the Holidays and all the events necessary. Birthdays, Weddings, Showers, Parties, Anniversaries, New Years, Christmas, Valentines Day, St. Patrick's Day, Easter, Mother's Day, Father's Day, Memorial Day, 4th of July, Summer, Spring, Winter, Fall, Thanksgiving, Halloween and most likely any other event needed. We have an enormous selection of Stamps, Embossing Folders and Beautiful Coordinated Decorative Papers. 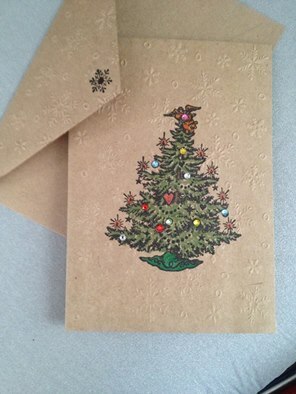 Our Cards and Tags are on Lt. Brown Card Stock and are of excellent quality Acid-Free Papers. We use only the highest quality crafting products as the end result is our most important concern. They all come with a matching envelope and are packaged in clear plastic sleeve. Medium Cards are: 4" x 5-1/2"
Medium Invitation Style Cards are: 5-1/4" x 4"
Gift Enclosure Cards are: 2-1/2" x 3-1/2"
TEA STAINED, STAMPED, EMBOSSED and HAND EMBELISHED TAGS. Medium Tags 4-3/4" x 2-1/8"
Large Tags 6-1/4" x 3-1/8"
Extra Large Tags 7-1/2" x 3-3/4"
.TEA STAINED, STAMPED, EMBOSSED and HAND EMBELISHED TAGS.